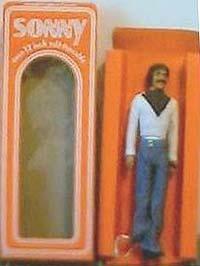 Mego celebrity dolls from the television show "The Sonny & Cher Comedy Hour" 1971-1974. They first came to our attention as singers with 1960s hits like "I Got You Babe" and The Beat Goes On" later they went on to entertain us in their TV show with more songs, skits and comedic teasing of one another and all those glorious fashions that Cher wore designed by Bob Mackie. We thought they'd go on together forever, but they didn't, when they divorced the show stopped and each took their separate paths. 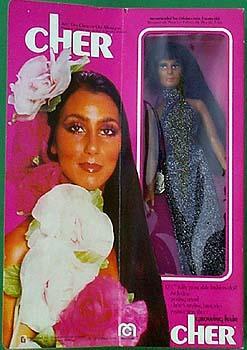 But the dolls remain, Cher with her Mackie wardrobe and Sonny in his tuxedos. 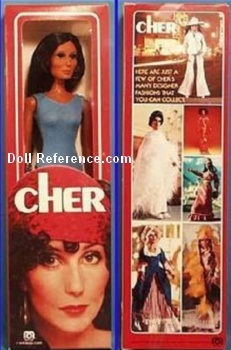 About 30 separate outfits available for the Cher doll and six for Sonny, along with special play sets like a dressing room. 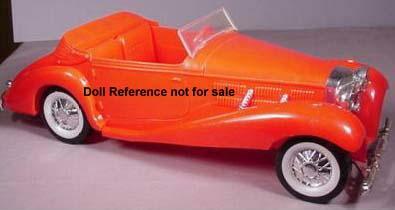 See below for Mego Sonny & Cher dolls and clothes identified. 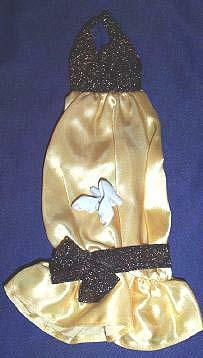 Very thin vinyl doll body, with long black rooted hair, wearing a blue, yellow or red nylon swimsuit. Doll is 12" tall, all vinyl, pose able, with jointed waist and wrists, painted hair and features, sun toned skin wearing long sleeve white shirt with V placket in black and bell bottom jean type slacks with black shoes. 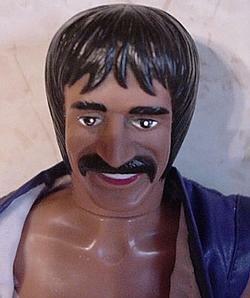 Close-up of Mego Sonny Bono doll's facial features. 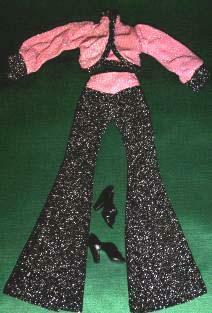 Growing Hair Cher, wearing a black and silver original outfit by Bob Mackie. (I don't know if this one has a name other than "original outfit". Usually found in blue - The green fashion does not appear in the catalogs and Robin Englehart of Vintagelane.com tells us she checked with a serious Cher collector - who told her this was the first she had ever known about this rare outfit. Cher in Yellow Feather "Squaw" Outfit. 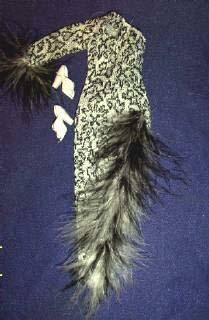 Cher Electric Feathers - Rare Red! Cher Glorious Gold - Rare! Mego (No. 62400) 1st Cher doll 1976 - Doll is 12 1/4" tall all vinyl, poseable, jointed waist and wrists, rooted black hair, painted eyes with rooted lashes, a sun tanned skin tone, wears a salmon halter top gown with flounce on the bottom doll marked on neck: © MEGO CORP. 1976.